The Moroccan national hockey team was on the ice against the national team of Andorra in the first game of two today at 2017 Development Cup. The Moroccan team won 9-3 to qualify for the finals tomorrow. The Moroccan national team held its second game of the day against the Portuguese team. 11-2 for Morocco and ended a perfect round robin portion of the tournament by going 3-0. Morocco will play in the Gold medal game tomorrow against Ireland who also won both games today against Andorra and Portugal. The Bronze Medal game will pit Portugal against Andorra, Portugal won the first encounter against the hosts 3-2 in a dramatic shootout. Ireland had a short history of World Championship play at the lower levels between 2004 and 2013. While the shutdown of the Republic of Ireland’s last rink caused a meltdown for Irish ice hockey, enthusiasts fight to keep the Irish ice hockey family alive. “A few years after the closing of the rink nothing was really happening. Since the current executive board took over four-and-a-half years ago we started building up with youth hockey. 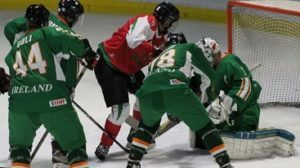 The last two years we have been successful with senior hockey too,” said Aaron Guli, the President of the Irish Ice Hockey Association, who also serves as both player (although a soon-to-be-retired one as he added) and team manager for the men’s national team that currently plays at the 2017 Development Cup, an initiative of smaller IIHF members that established a tournament among themselves. “The level starts to pick up. We started with four teams, now we have 11 teams in the Cross-Border Cup,” he said. In that competition seven teams play from the Republic of Ireland and four from Northern Ireland (UK) with all games being played in the Belfast area in Northern Ireland. In Andorra the men’s national team plays for international honours for the first time in four years. While the other countries come from warmer places, Ireland geographically doesn’t exactly look like an exotic place for ice sports. The capital of Dublin is at a similar latitude like hockey places such as Astana, Berlin, Edmonton, Minsk, Saskatoon, Sheffield or Ufa. And then there were players of Irish heritage in the NHL. And in the state of Indiana, USA, the University of Notre Dame’s sports teams are nicknamed the “Fighting Irish”, including their NCAA ice hockey team. However, opposed to all these places the Republic of Ireland just has lacked an ice rink for the past seven years. And that’s obviously a major problem to keep the sport striving. “Mismanagement with too many owners led to the closure in 2010. The arena is not used anymore but the boards and the Zamboni are still there. There’s a business plan ready to meet for a possible re-opening,” he said about the former ice rink in Dunedin. The first games in Ireland were played in the ‘80s and the Irish Ice Hockey Association joined the IIHF in 1996. The country got a permanent full-size rink in 2006 with the Dundalk Ice Dome that also hosted the 2007 IIHF Ice Hockey World Championship Division III. A sell-out crowd of 1,522 saw how Ireland beat Luxemburg 4-3 in shootout to earn promotion to the Division II level for one year. In 2010 the Irish earned promotion again a few weeks before the rink halfway between the country’s capital of Dublin and the Northern Irish capital of Belfast shut its doors. The national team couldn’t keep momentum and hasn’t played in the World Championship program since 2013. Once there were 1,100 players in the Republic of Ireland. Without an ice rink many quit the sport or turned to inline hockey. According to Guli 400 players are still active and play ice hockey in exile in the Belfast area. Belfast is a little less than two hours away by car from the Irish capital of Dublin and about one hour from the former hockey town of Dundalk. “We started a recreational league, now the national team players get 15 games a season,” Guli said. Most players come from the Republic of Ireland while goaltender Chris Devine is from Northern Ireland, Ian Courtney plays in London, England, 2000-born Thomas Carpenter for Swiss fourth-tier team HC Chateau d’Oex and Declan Weir for German minor-league team EA Schongau. Two players (Paul Cummins, Niall McEvoy) played for the senior national team in IIHF play and Vytautas Lukosevicius, who emigrated to Ireland in 2007, represented his native country Lithuania at Division I level until 2004. To get back to former heights, the IIHA is not only in discussion with the Dundalk ice rink owners but also for a new rink in the country’s capital. “We are talking with potential investors for a rink in Dublin. We met with them and with Sport Ireland. The investors are looking for 2,500 seats to put in a professional team,” Guli said. Professional team, that would ideally mean one playing in the top British contest, the Elite Ice Hockey League. And a possible derby with the Northern Irish neighbours. “The Belfast Giants would love it!” Guli said. Until then the Irish try to grow the program with playing in exile. “We keep the kids going so that there’s a clear pathway now. That’s why we pushed with the Development Cup that we have a senior national team going for them to look up to,” Guli said. The Irish had a rough start against Morocco, 10-2, but then beat both Portugal (9-4) and Andorra (5-3) on Saturday to set up a final against Morocco. The level was quite different. As Guli said, the game against Morocco was the first one with body-checking for some of the players in several years. “We battled hard. Unfortunately we were on the wrong side of the score line. All three lines gave it a 110 per cent. I couldn’t ask for more,” Nigel Smeaton, the Cyprus-born Irish head coach who currently lives and plays in Dubai, said after the game. For Smeaton development is the key. “We have young players. This squad will eventually feed the senior World Championship squad in the future,” Smeaton said. After the two wins against the southern European competitors, the Irish hope for revenge on Sunday in the final against Morocco. Portugal and Andorra will play for third place. Going to the Olympics was a life-changing experience for T.J. Oshie, a shootout star for the United States against Russia in Sochi. Oshie and dozens, if not hundreds, of NHL stars are disappointed they won’t get a chance to do it again at the 2018 Winter Olympics in South Korea. He would like to ensure Olympic participation in the future – but not at any cost. Because Olympic participation wasn’t written into the collective bargaining agreement signed in 2013, the decision rested with NHL owners, who decided against going to Pyeongchang after the league participated in the previous five Games. With the first chance for players or owners to opt out of the CBA now two years away, the Olympics, escrow payments and the draft age look like they are bound to be among the hot topics. The future of the game likely will involve increased international events that help grow revenue and spread hockey’s influence around the world. The Los Angeles Kings and Vancouver Canucks recently played in Shanghai and Beijing, site of the 2022 Olympics, with the NHL attempting to make inroads in China. The NHL and NHLPA staged the return of the World Cup of Hockey last year in Toronto, and the Colorado Avalanche and Ottawa Senators will play two games in Sweden in November. The NHL is interested in China, and it wouldn’t hurt the players’ Olympic chances if Salt Lake City or Calgary lands the 2026 Winter Games, but the topic of ensuring participation is not an easy one for upcoming negotiations. ”For us to say that there’s a change of heart, there’s obviously going to have to be a change in circumstance, including how the (International Olympic Committee) and the (International Ice Hockey Federation) view our participation,” said Bettman, who noted that neither side is currently focused on reopening CBA talks. After 147 NHL players participated in Sochi, much of the reaction inside locker rooms to the NHL’s decision on Korea wasn’t positive. At the very least, a handful of players said they’d like to know in advance about the Olympics so it doesn’t come down to the wire like it did last time. One thing that hasn’t been open to interpretation since 2013 is players having some of their pay held in escrow to compensate for the 50/50 split of revenue with owners. Last season, players had 15.5 percent of their pay withheld and many have expressed displeasure with the system. Fehr said changes could be made to the escrow system, but added that it has always been his view that salary caps ”cause all kinds of problems.” The NHL and NHLPA instituted the salary cap coming out of the 2004-05 lockout that wiped out a season, and Bettman is proud of the competitive balance it has created. ”That’s why we fought so hard and we were committed to getting a system that would enable all of our teams to be competitive,” Bettman said. Another topic that is likely to spark conversation is raising the draft age from 18 to 19. Former player and current NHLPA special assistant to the executive director Mathieu Schneider said it can be a positive but knows there are challenges to changing it like the NBA did several years ago. Fehr, who was executive director of the Major League Baseball Players Association from 1985-2009 and has headed the NHLPA for the past seven years, said preparations for the next round of bargaining will ramp up after the executive board meeting next summer. With plenty of conversations left to have, he thinks it’s too early to tell what will be the central issues when push comes to shove.